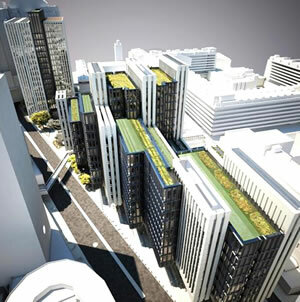 The £340 million London Wall Project has commenced by the contractor Brookfield Multiplex. Work has begun demolishing the 17-storey, 1960’s office block, namely St Alphage House, to make way for the 500,000 sq feet of new office space. The new development will consist of two major buildings, one 18-storey and another 14-storey, compromising spectacular rooftop gardens, which deliver excellent views over St Paul’s and London City. Over half the site will be given to open space, which includes a variety of links through to new gardens and access to a range of historic monuments, such as the church walls and the remains of St Alphage Church Tower. London Wall Place is expected to become one of London’s great city landmarks, with the unique internal and external design, and prominent features, it will stand out as a distinctive piece of city architecture. The building is set for completion in 2014, being ready for full occupation mid-2015. 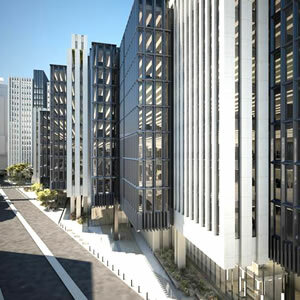 The new development at London Wall Place is welcomed by many, as it transforms the desolate building into a vibrant new working area. Armorgard are looking forward to working with our distributors and maximising the use of Armorgard products on this construction site, with the greatest potential for some of our material handling products and also the standard site boxes and other tool and equipment storage. Get in touch if you are supplying contractors on this site.